I saw this old picture (left) of Jon Stewart with a pot- smoking monkey the other day and it reminded me of my monkey in Vietnam. His name was George and he smoked pot every chance he got! I spotted George while working on a construction project in the bush. He came up to me when I offered him a stale roll and I decided to bring him back to my company. To my utter amazement George seemed interested in trying pot from Day One. He snatched a doob out of my hand one morning and ate it. About 45 minutes later George was dancing around on his hind legs and making funny gestures. He chirped like a bird and laughed like a hyena! The next step was getting him to take a hit from my doob and to give it back to me. That took about two weeks of intensive training. I finally decided he was ready to be presented to my fellow Stoners in the company. We use to meet in an old Buddhist graveyard and swap stories and weed. George caused quite a stir from day one when I took a deep hit from my doobie and handed it to him and he politely accepted it. There was a moment of silence as all eyes watched George's every move. When he put the doobie to his lips and took a long drag bedlam broke out! My fellow Stoners were blown away by him and immediately wanted to share their smoke too. It didn't take long for word to get out to other nearby units that we had a mascot monkey that got stoned. I think it was the fact that he shared doobies that made him stand out. There were other monkeys in units, but none of them shared pot (that I was aware of). 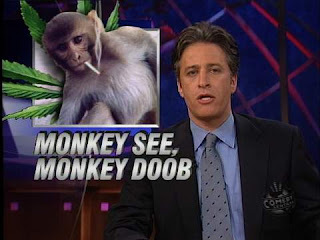 Let's just say I never heard of another pot-loving simian smoking weed while I was there. I had plans to bring George home with me when the time came to rotate out of Vietnam. But, as they say, the plans of monkeys and men oft go astray! I don't want to harsh your high today and tell you exactly what happened to George. Suffice to say he didn't come home with me. I only had George for seven months, but in that time I grew attached to him. To preserve his memory I share George's story whenever I can. I suppose you could say it's not your usual war story.